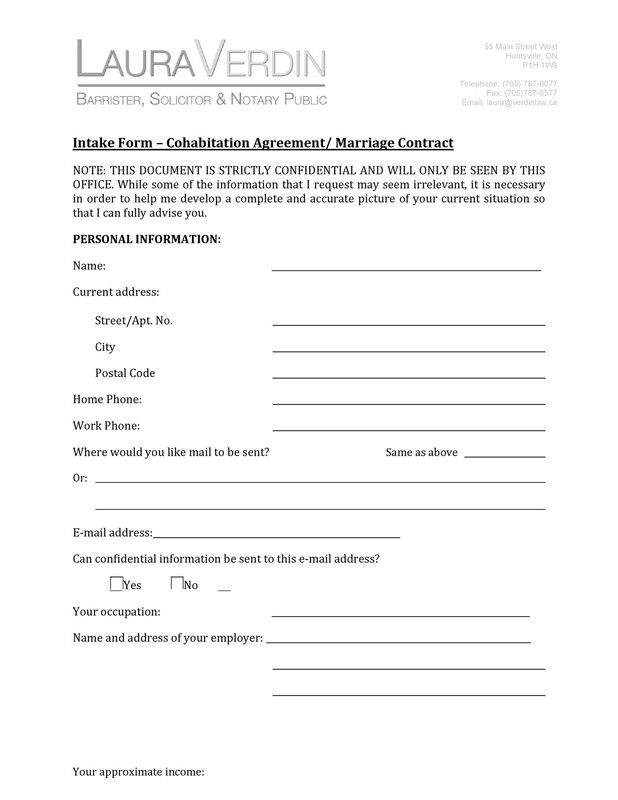 Couples who are committed to each other and have decided to live with each other even if they are not married may want to sign a cohabitation agreement form. 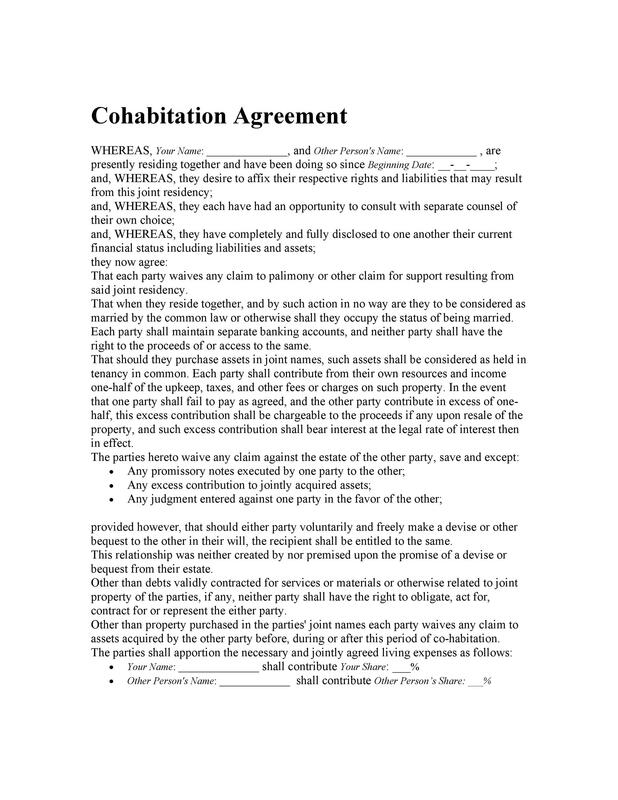 But exactly what is a cohabitation agreement? 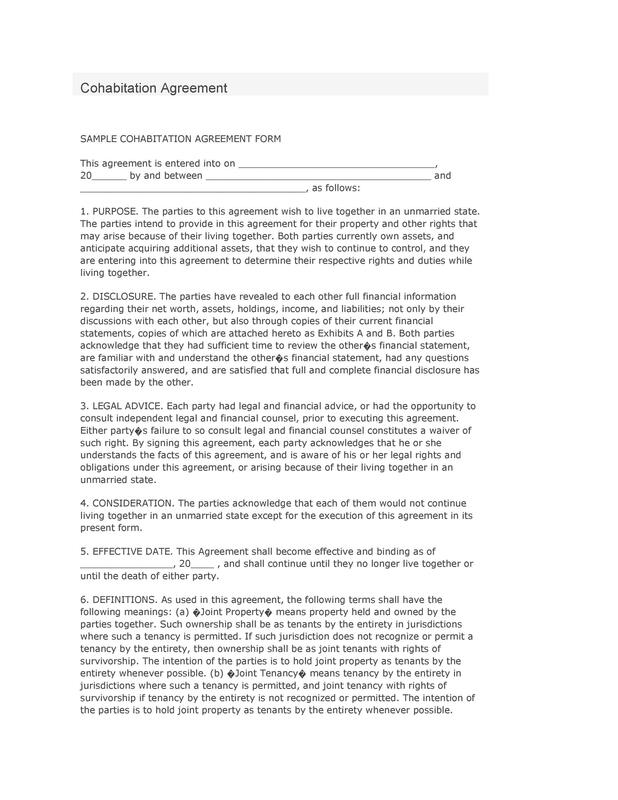 It’s actually a type of legal agreement between two people who have chosen to live under one roof. There are cases when such a couple would be treated as if they were married, like in the cases of agreeing upon child support or applying for a mortgage, but not in all cases. In some situations, like dealing with pensions, property rights or inheritance, they are treated separately. 6 When are Cohabitation Agreements Appropriate to Use? 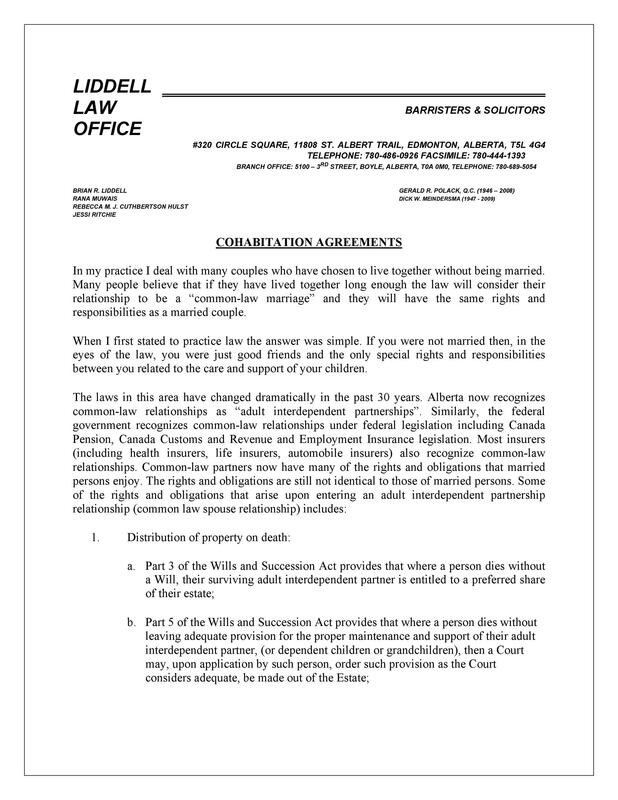 This agreement would include documents and records for a couple who’d like to start living together as protection from costs and litigations, which would be unnecessary in case their cohabitation doesn’t work out. 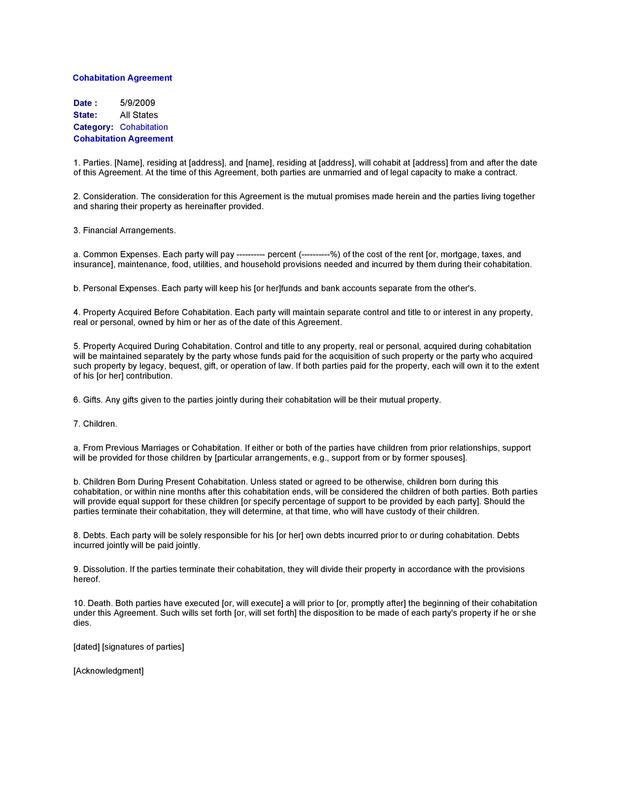 The couple can clarify all the arrangements within the agreement in all aspects. 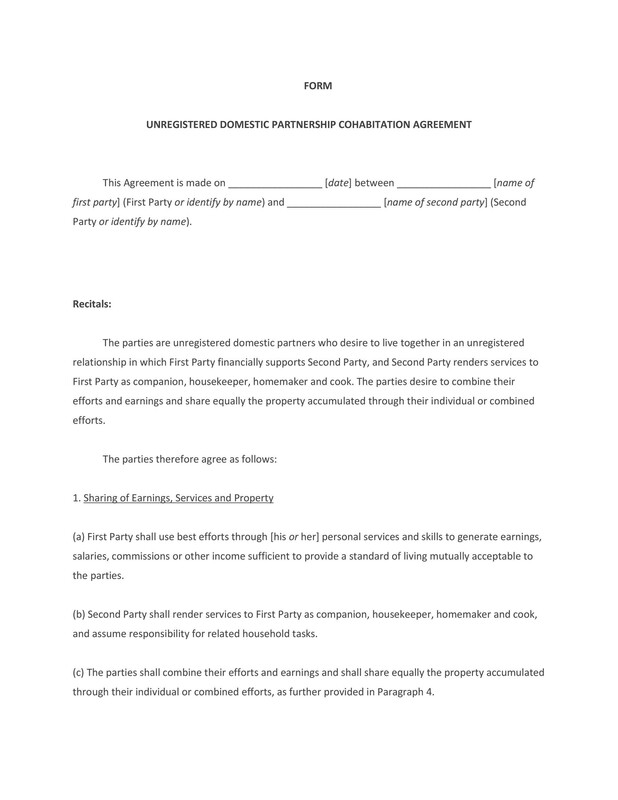 Similar to a prenuptial agreement, this document would permit the couple to establish, from the beginning, who will be keeping certain assets and what would happen to joint assets if they separate. One of its main purposes is to bind both parties to each other. 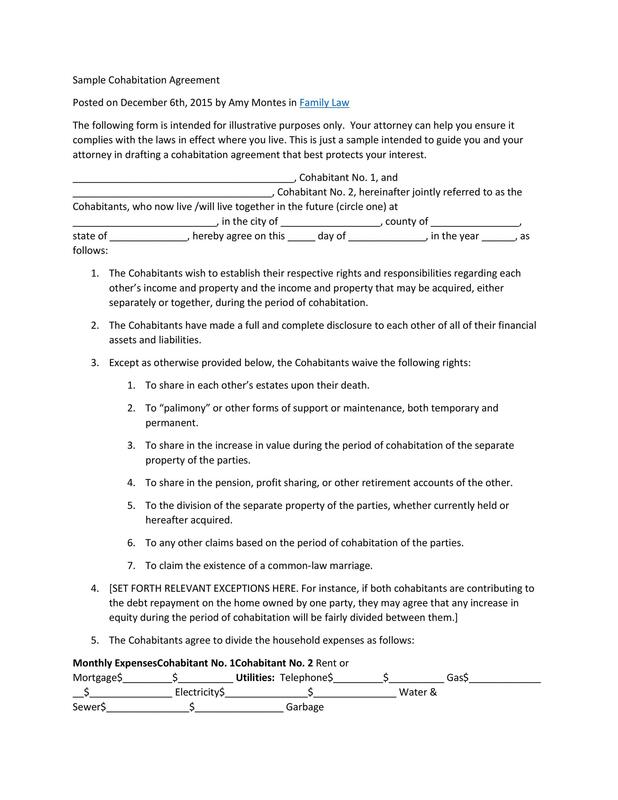 These documents are each signed by the couples who are planning to live together or even those who are already living together. They usually contain information about how debts or properties will be divided or whether any kind of support will be paid if their relationship would break down. 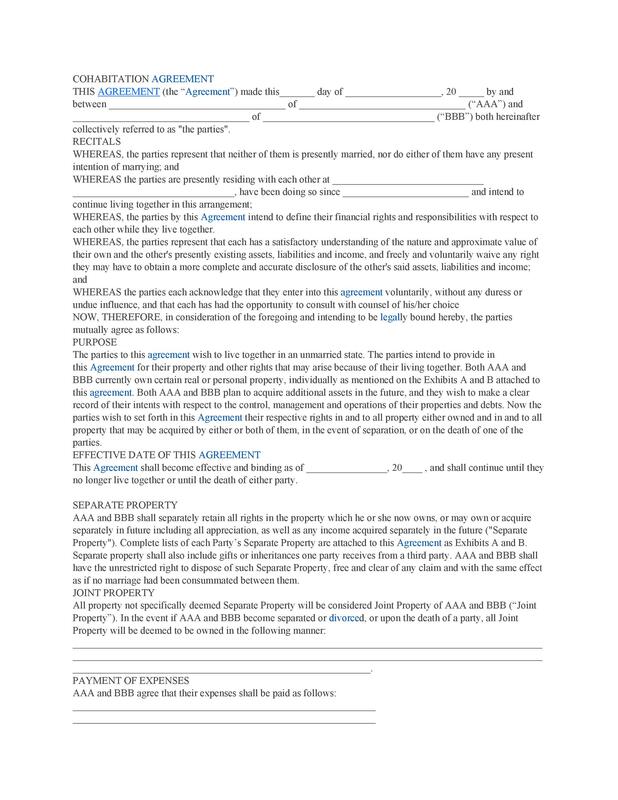 Such a document can also include deals and agreements while in the relationship, such as the division of chores and expenses. 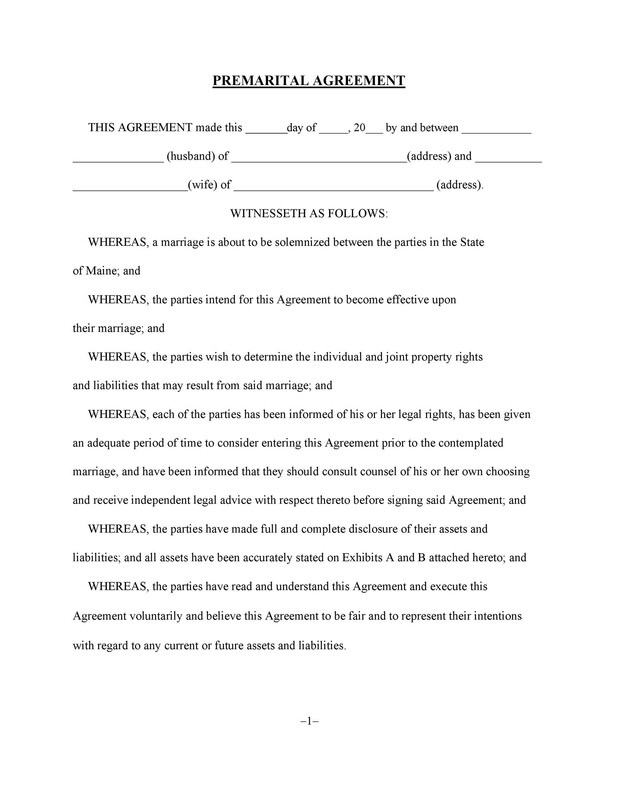 However, couples who are living together or are planning to aren’t required to sign such an agreement, unless they both want to. Financial arrangements during the relationship of when it comes to an end. How debts would have to be paid for. Rights to stand as the conservator or guardian to the other in the event one of the parties is incapacitated. Rights in making emergency or routine medical decisions for each other. When a relationship gets deeper and more serious, you as a couple would most likely start thinking about taking the next step which would solidify and validate the growth of your relationship. For those who don’t want to be married, this is the best and most logical next step and it would signify that your relationship is, in fact, progressing. Living together may be a sort of “trial run” before you actually get married. It would give you a chance to get to know your partner more and learn about each other’s living habits before entering into a more legal commitment. So as you agree to live together and make it official, you would be giving yourself an opportunity which would strengthen your ties. When you and your partner come to terms with what is to be written and included in your cohabitation agreement form, you’d be able to decide how your finances will be handled. As you will be living together, you’d most likely be sharing the daily living expenses, which means that you would save a lot of money. Sharing the expenses is great for your relationship and you’d be able to budget your finances a lot better. 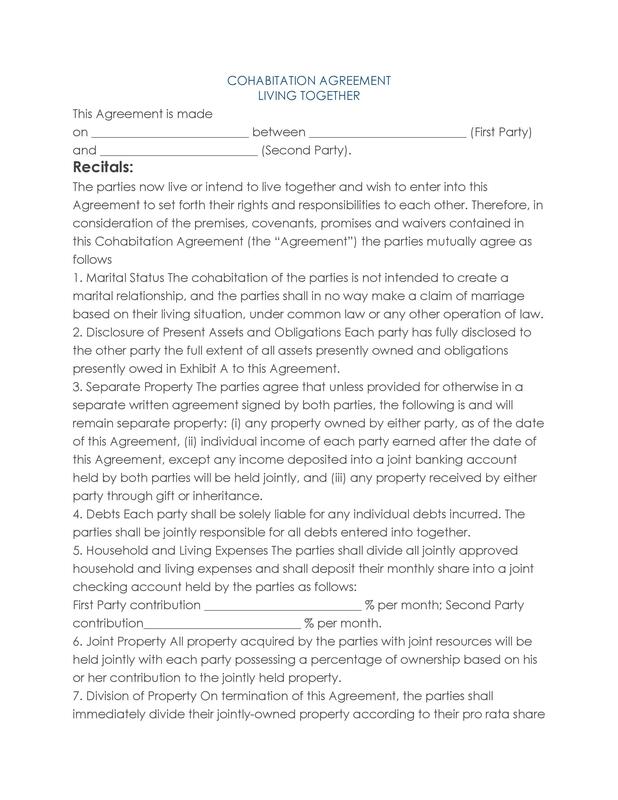 Depending on what you and your partner had agreed upon in the document, you make the decision to live together. 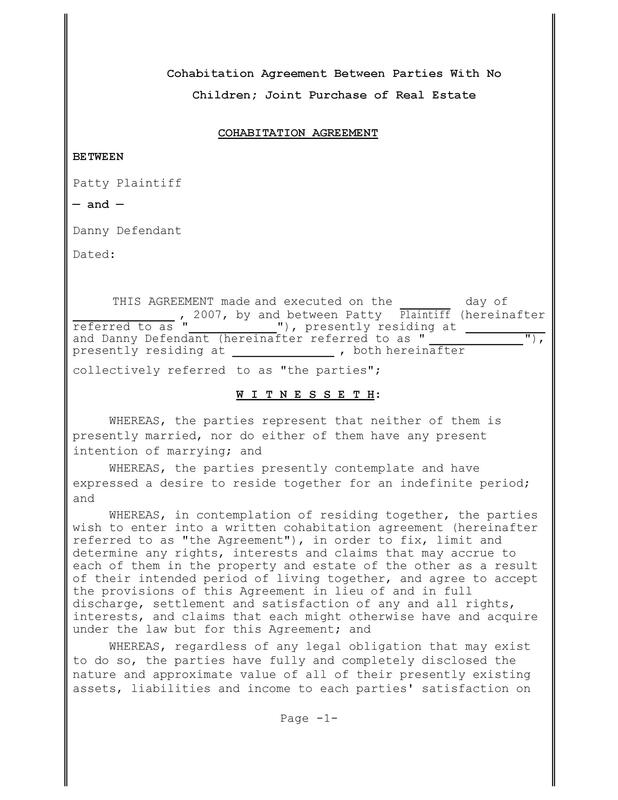 When you have an official document to support your decision, you’d somehow already be responsible for your partner. You’d be making decisions which would be based on what’s best, not only for you but also for your partner and for both of you as a couple. Through this, your relationship will most likely grow and become a lot stronger. 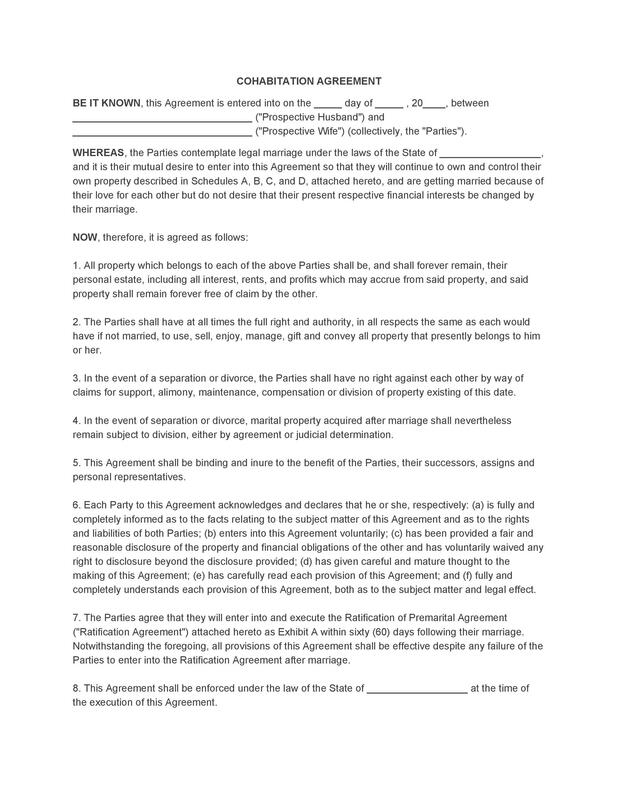 As you’ve outlined and covered all the relevant issues in your agreement, you would have also covered what would happen in the event that things go south and your relationship comes to an end. You would then have the freedom to leave as you would already know what the consequences are. As you can see, there are many benefits to reaching this kind of agreement as you live together in a home with your partner. You can ask for legal consultation when you are planning to make such an agreement however it would be good for you to know what should be covered. 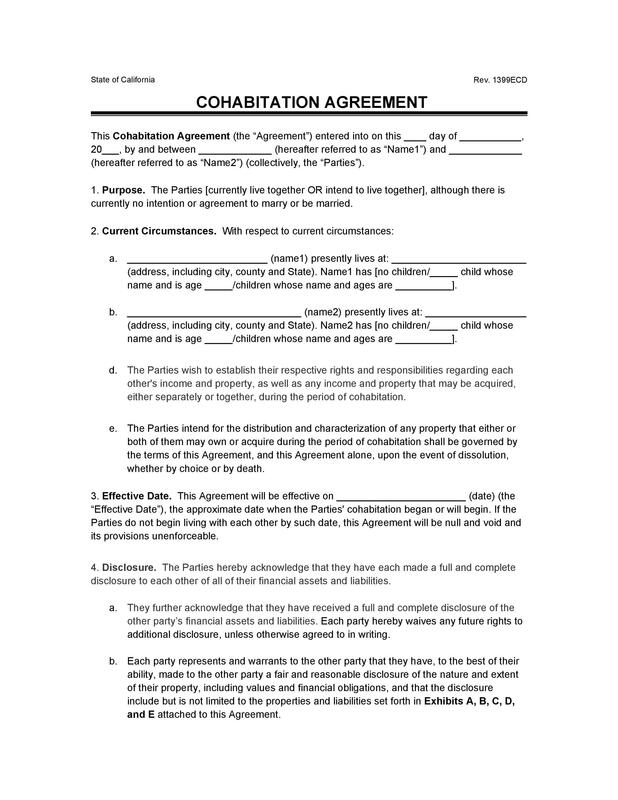 Now that you have a better idea of what is a cohabitation agreement, you may already be thinking about making one for you and your partner. Before you do so, let’s take a look at the issues which should be covered in the very basic kind of agreement. You may, however, make changes if you think some of these don’t apply to you. How the real estate property will be acquired (separately or joint). If purchased together, how would the division of payment be? If the division is not equal, how would the ownership of the property be? 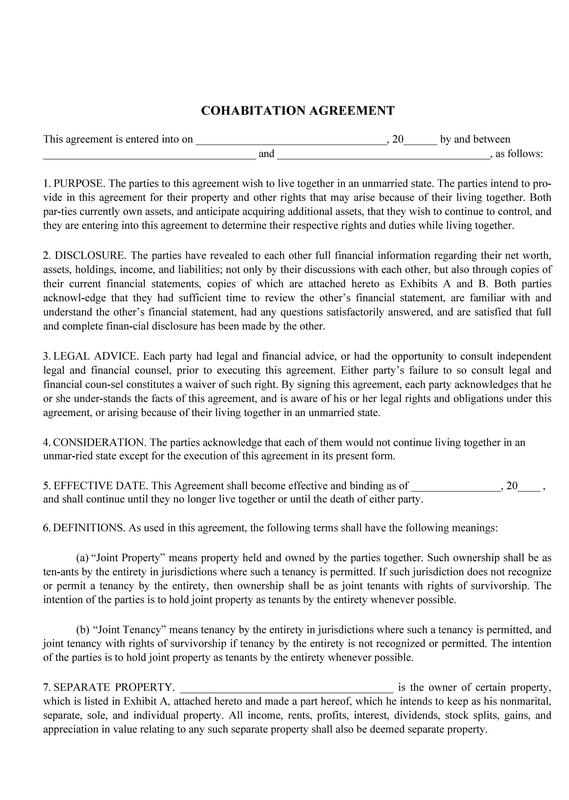 What would happen to the property in the event that the relationship ends for whatever reason? Of course, when you enter into a relationship with another person, you would already have your own personal properties. 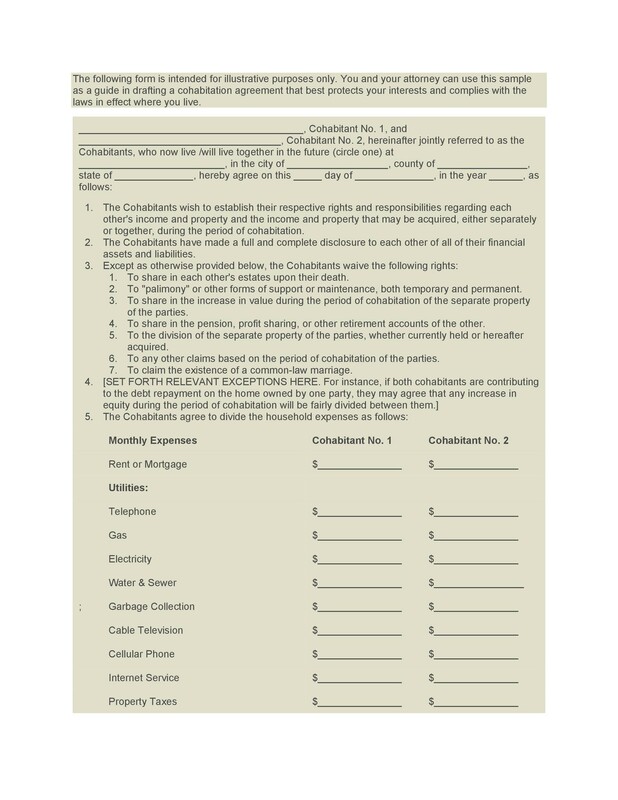 You can place a section in your agreement whether you choose to continue to separately own your personal property or not. Living together as a couple would allow you to save a lot of money as opposed to when you were living separately. 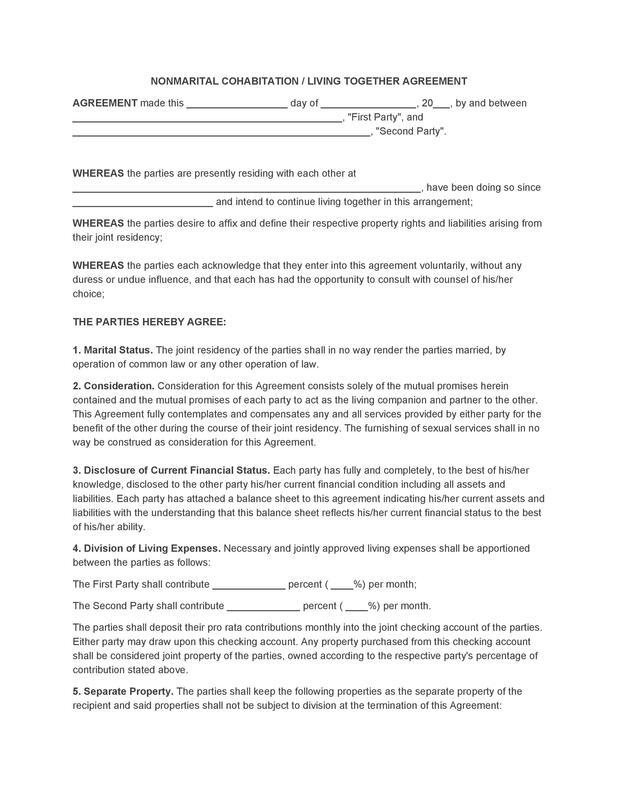 However, you would have to decide how joint expenses would be managed, and you can place all these in your agreement. From the beginning, you can make a decision on how you would be spending together and what parts of your income can go to savings and to expenses for joint properties. There may be cases where you or your partner may have financial obligations to a previous partner. In cases like these, you’d have to talk about how much financial assistance you would be giving and where it would be coming from. 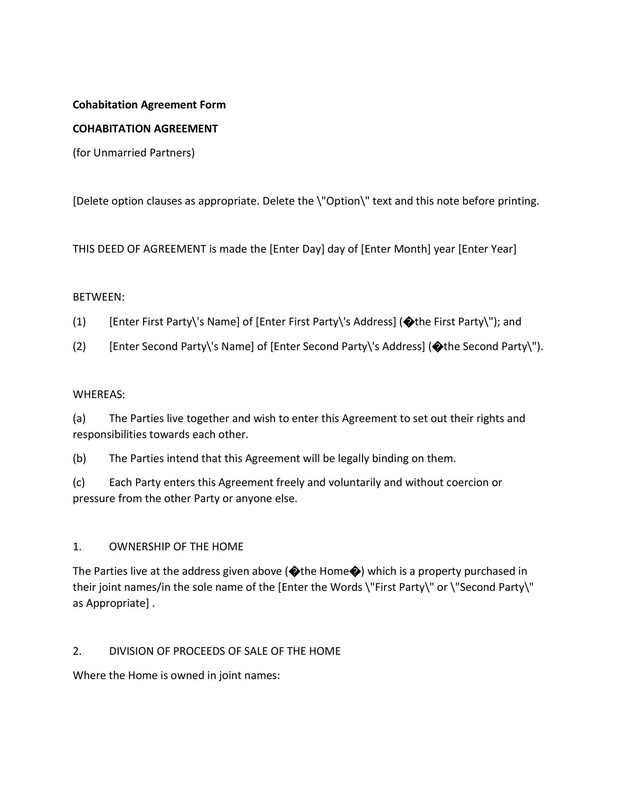 You can place all the details in the agreement so everything is clear and it won’t be a source of arguments between you. One of the important parts of such an agreement would be to discuss what is to be done in the event that one of you passes away. Whether you have children or not, there will be a lot of things to take care of, especially when you, your partner or both of you as a couple have a lot of assets, properties or even debts. You’d have to clearly define what is to be done so that no loose ends are left if one of you dies. 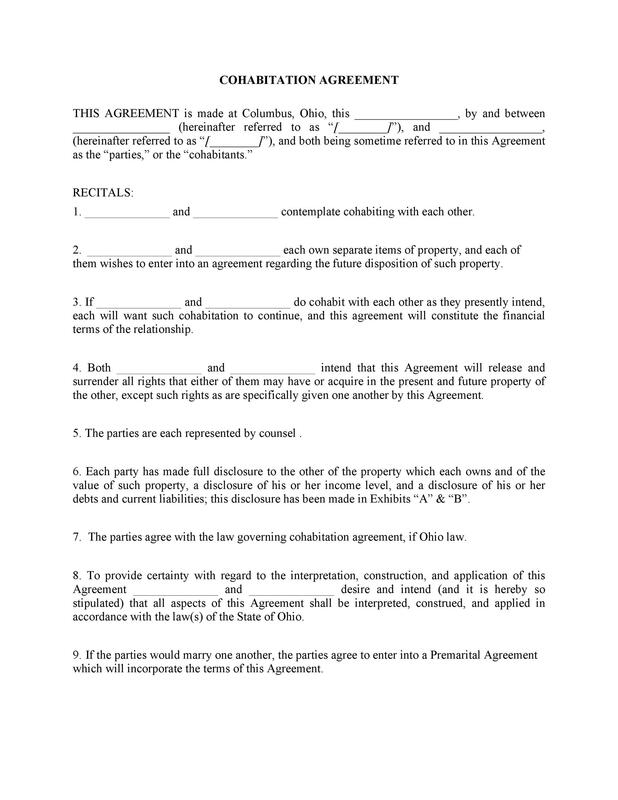 These kinds of agreements weren’t always legal but over the years, a lot of the states have come to accept them as such. 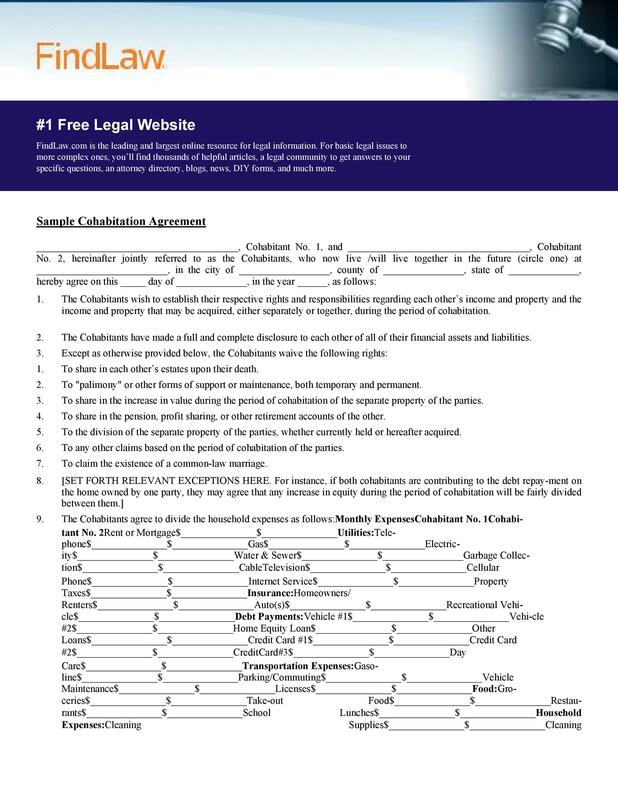 It’s highly recommended for you and your partner to enter such an official agreement, for your own protection and peace of mind. Having such a document would ensure that no matter what happens, you know what the consequences are. 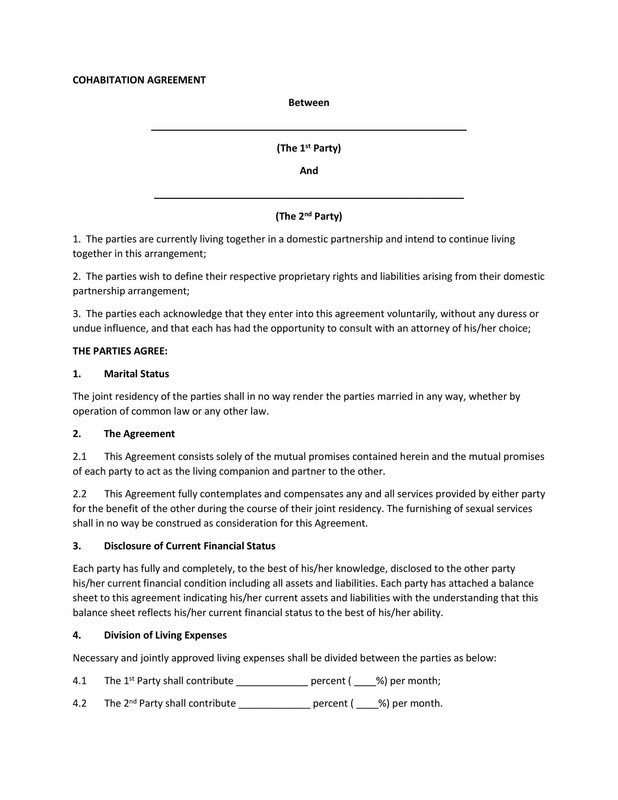 Though very similar, such an agreement is not the same as prenuptial agreements. 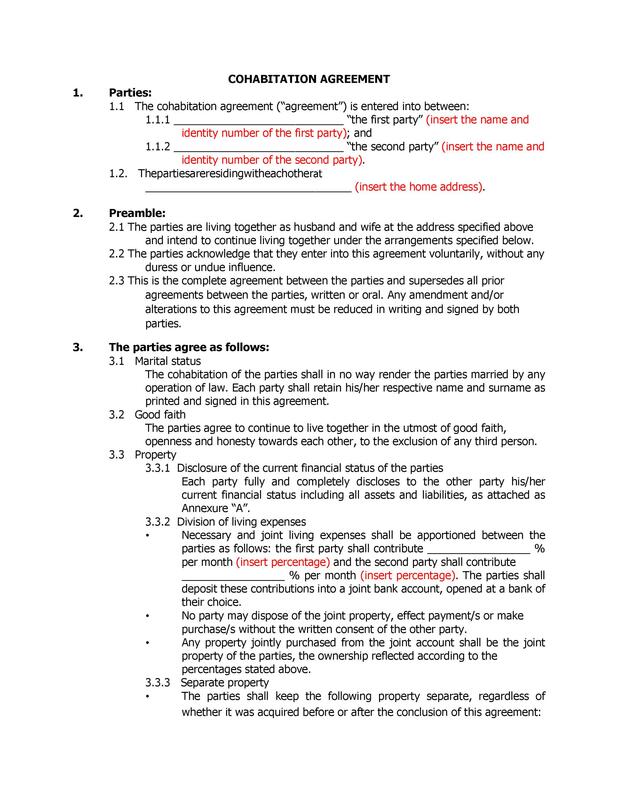 The main difference is that this document is for those who are just planning to live together but are not planning to get married. It would also contain details on what is to be done during the relationship and what would happen when it ends. As long as you cover these issues, you would already have a pretty good cohabitation agreement. However, you may add other concepts, sections or issues if you think they are relevant to your relationship. But such agreements aren’t always appropriate, it would depend on the situation, which will be discussed in the next section. When are Cohabitation Agreements Appropriate to Use? you are expecting that spousal support might end up being an issue when your relationship comes to an end. Basically, these situations are wherein you and your partner are not very serious yet and are still starting to build your own lives. 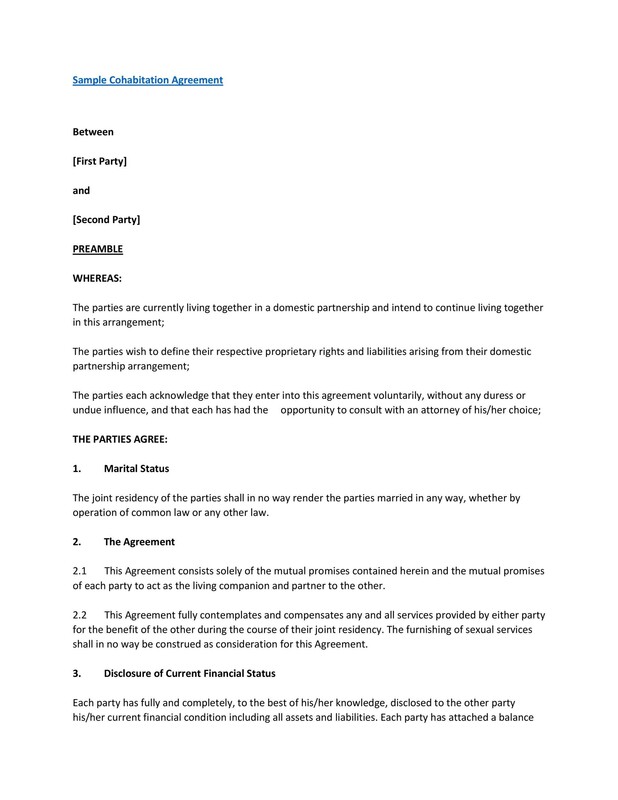 This is because these kinds of agreements are more useful and beneficial for setting rules for how things will be dealt with during the relationship. So it’s more appropriate for situations when the relationship is more serious and the couple is more established, meaning they may have their own property, assets, debts and such. Who will be paying for the expenses in the household? Will you be assigning each party with separate bills to pay or will you be sharing all the expenses? Will you each have your own bank accounts or will you have a joint account to cover all costs? If you decide to have a joint account, how much will you and your partner contribute to it? Who will be doing the household chores? Will you share the responsibilities equally or will you rotate the chores? If any children will be brought into the relationship, how will they be cared for? Will the partner with no children assume any parenting responsibilities? These are very relevant issues which need to be dealt with and if you think you would need an official document to clarify the answers to these questions, then go ahead and make one. Basically, this kind of agreement would explain or make clear the details of how a couple will manage the important parts of their relationship. It would contain the responsibilities and the division of labor and finances, which can be very useful and helpful especially for couples who are busy and may tend to neglect responsibilities. Rather than start fighting in the middle of the relationship, you can agree upon the terms and establish the important details. Then you can focus on the minor things and focus on strengthening your relationship too. Another important thing to note is that the agreement should also specify what is to happen in the case that the couple would decide on getting married. 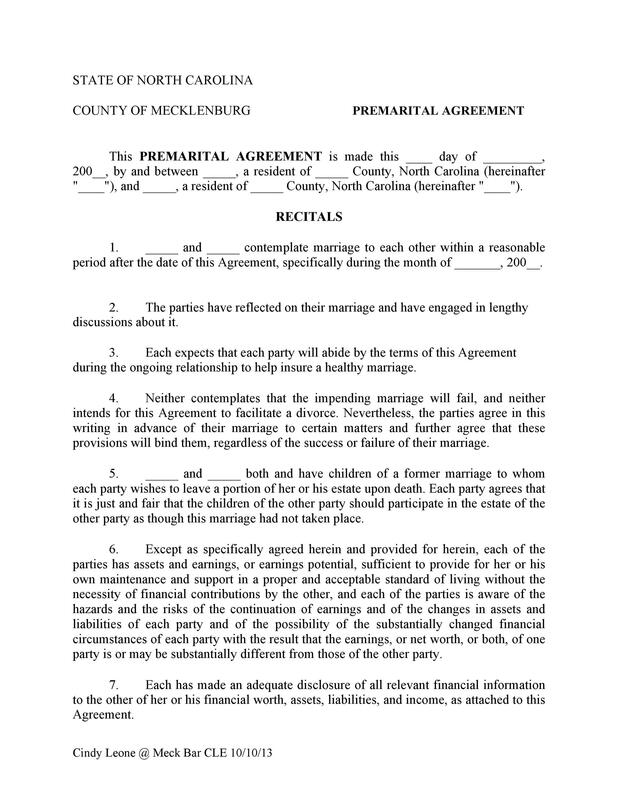 You can continue the agreement after marriage or choose to terminate it after you’ve done so. Either that or you can just make some modifications in the details and terms to better suit your new relationship status. Either way, you’d have to come up with other legal requirements when you will be creating and submitting a cohabitation agreement form. Let’s discuss those next. 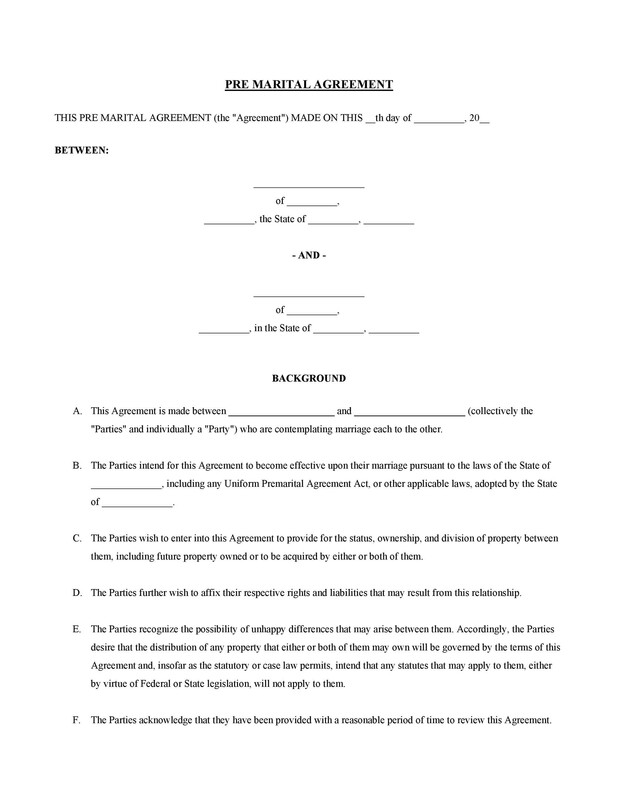 First off, remember that your agreement must be in writing and not just orally stated. 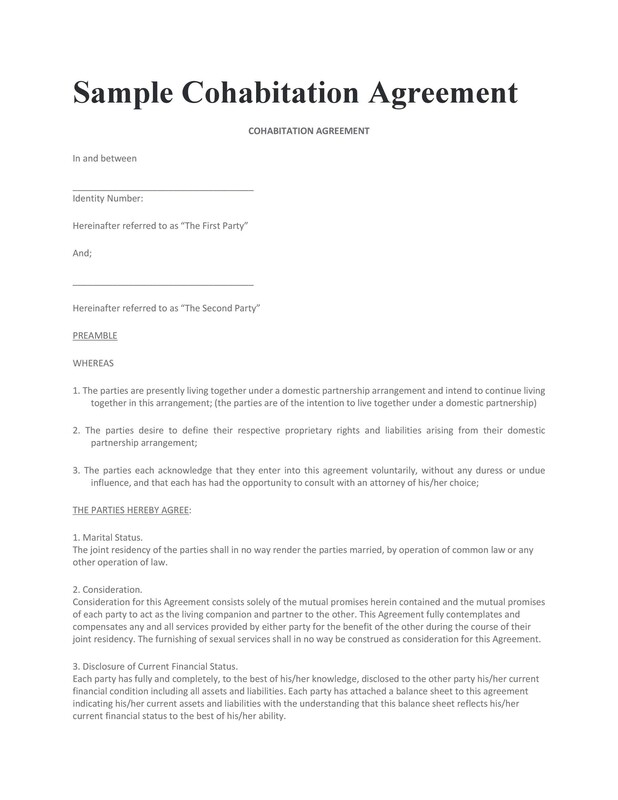 It should be signed by you and your partner and your should both sign it in the presence of a third party or a witness. Though still valid without one, it would still be a better idea to sign your agreement in the presence of a witness to make it a lot more valid. 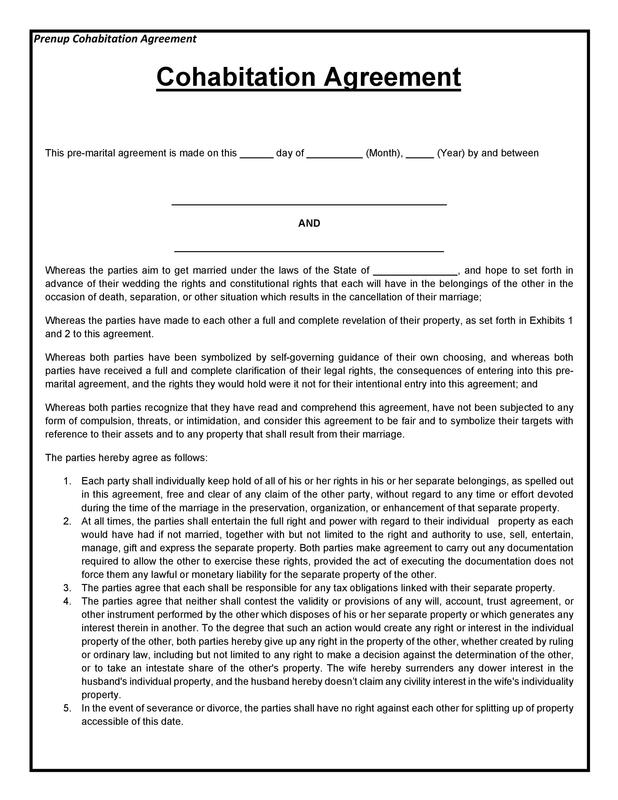 You or your partner should not have any legal disability when you are signing the agreement. It must clearly establish each party and the nature of their rights and their responsibilities to each other. 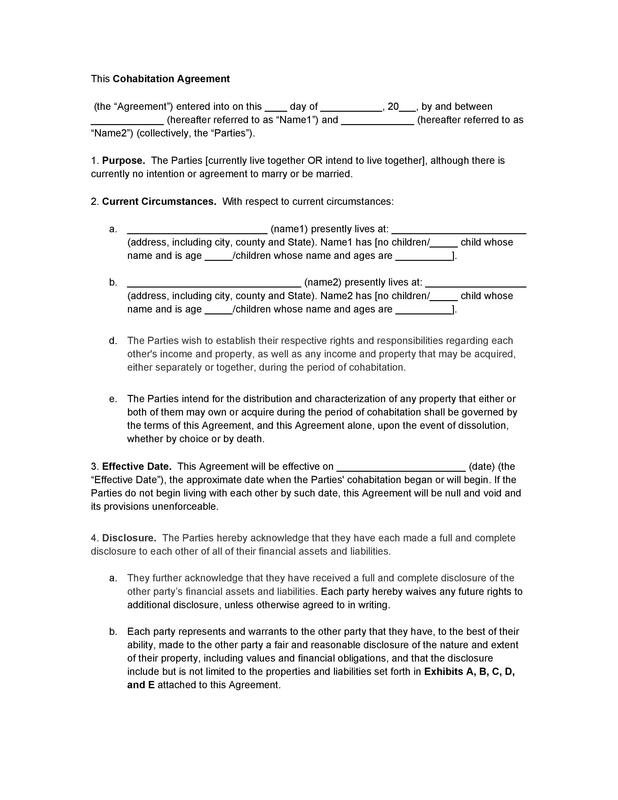 You and your partner must enter into the agreement willingly. You should not be coerced or forced by the other party or by anyone else. 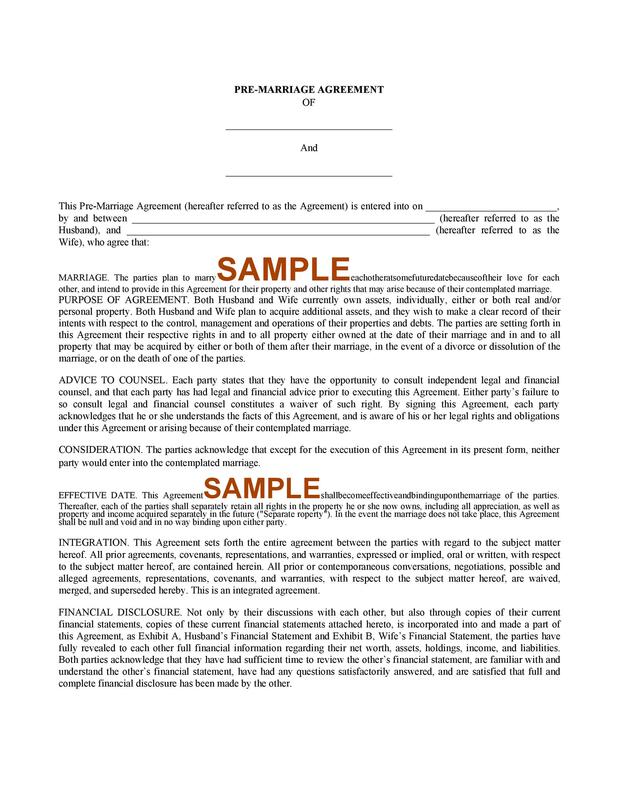 You and your partner must make a complete disclosure of any and all circumstances when entering into such an agreement. This would include any assets, properties, debts or other relevant information. You and your partner should not make any agreement which would obligate you to break the law or do anything illegal. When your agreement is made by the lawyer of one party, the other may choose to have the information in it interpreted if anything is unclear. 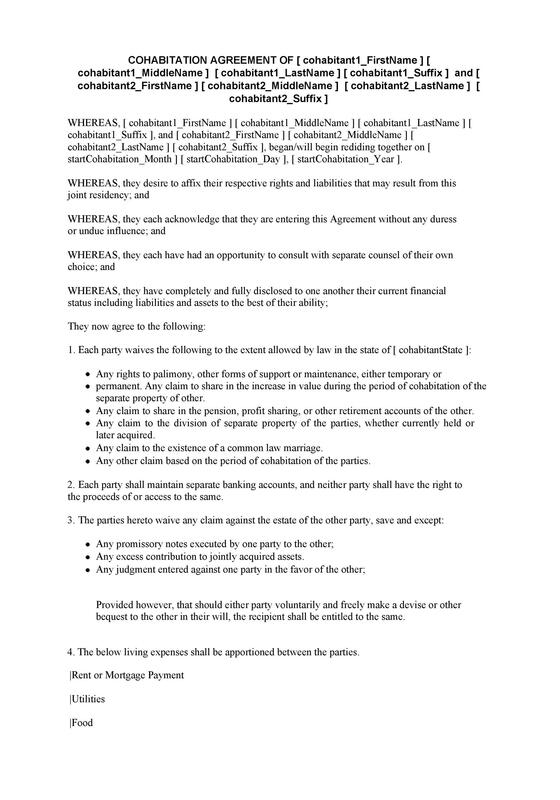 If any part of the agreement is discovered to be invalid, then only that part of the agreement will cease from being in effect. 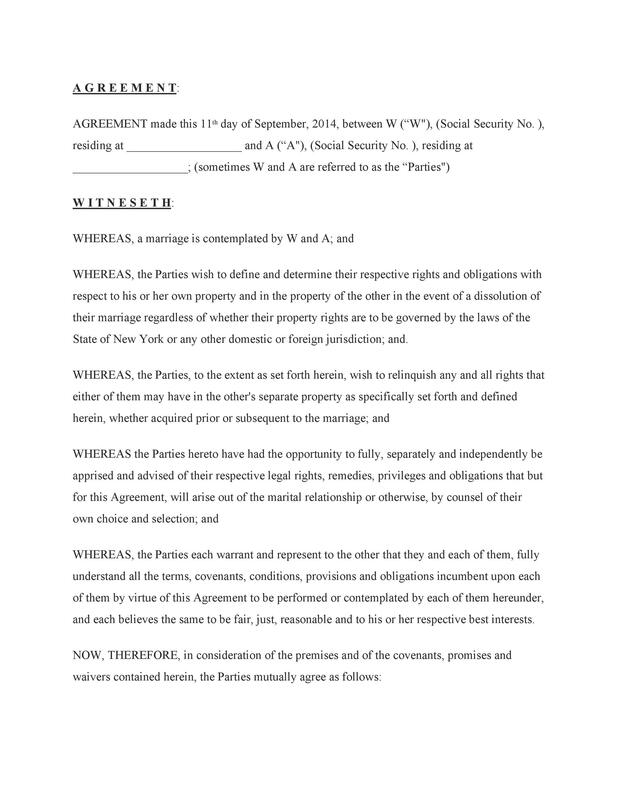 The rest of the agreement will still be valid and shall still be considered as such by you and your partner. Any issues regarding properties, assets, and debts will only be dealt with in the event that the relationship comes to an end. Then it should have already been written in the document what is to be done with the said issues. It would be better for you and your partner to hire a lawyer when you are planning to create and enter into a cohabitation agreement. This is so that everything in it would be official, legal and valid. If you still want to make it yourself, then you can consult with a lawyer after to check if your agreement is valid and can be considered as legal.